Some weird bug motivated me to put together the Wrath of Kings Goritsi I picked up at a Huzzah swap meet a few months back. Of course, I quickly ran into the same problem Shaefer ran into*: what the hell were they thinking when they chose those bases? The MicroArt Studios insert idea is Clever, but when they’re not available, it’s not a viable. (As far as I know they’ve all shipped to backers but if, say, you wanted a type you didn’t select in the pledge manager or didn’t back it, you’re SOL.) It’s a decision that boggles the mind the point of actively aggravating me. Anyway: just buying a back of round-lipped bases is Too Easy, and I’m not enthused enough about these minis to want to put them on resin bases. 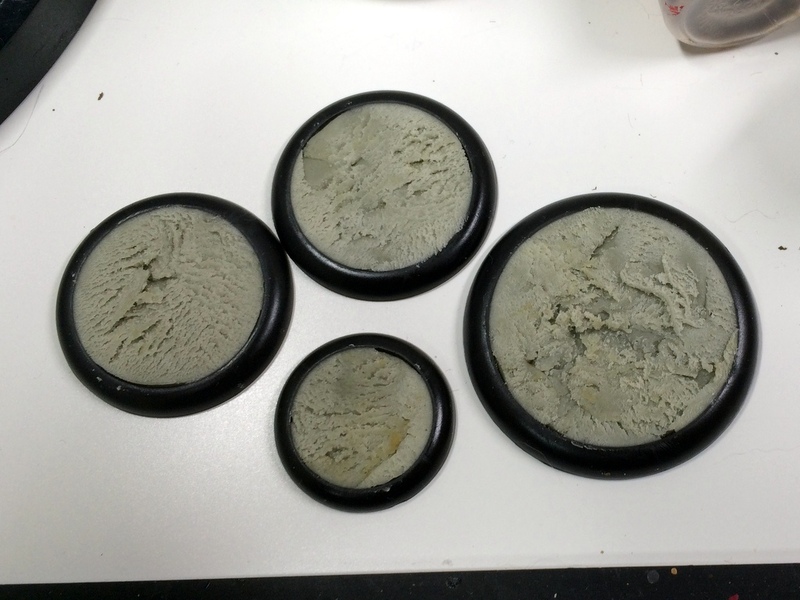 So I took my advice to Mike: I filled the bases with Apoxie Sculpt. To prevent it from looking lumpy and mushy, I scraped over the top with a spackle knife. It’s a tacky material, so it stuck to the blade… which meant I got a neat texture out out of the process. I’m not sure what I’ll do with it: just drybrush over it and call it ground or maybe fill the gaps with a color and, with a little gloss, call it marble. Anyway, I thought it was neat-looking. That might not be the right link; I know I suggested Apoxie Sculpt and that seems to be on a different post. This entry was posted in Warpstone Pile on 2015-08-25 by Rushputin.